But so what? Why should your office in Milpitas have automated lights? Here are four reasons why. A lower electricity bill is one of the primary benefits offered by automated lighting. When your lights are set to automatically switch on and off at specific times of the day, the chances of them being left on overnight or being used longer than necessary are eliminated. If you have a large office, this could save you hundreds of dollars every month. An automated lighting system makes things easier for your employees. When lights are automated, they’re sure to come to a well-lit office every morning and start their day energized. They also don’t have to worry about turning the lights off when leaving after a day at work. Other automation features, such as sensors, provide instant brightness to spaces like meeting and conference rooms, stockrooms, and pantries without having to flick a switch. The ideal office lighting setup is adjustable, mainly because we need different levels of light for different situations. With automatic lighting systems, features such as dimmers allow you to change the brightness of your lights to any level you need. 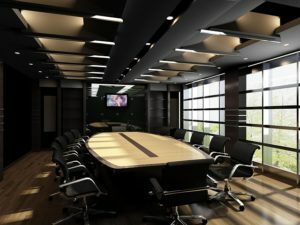 For example, if you need to dim the conference room for a presentation, simply turn the dimmer knob and you’re all set. Likewise, office areas like the employee lounge will also benefit from dimmers, especially when the lounge is where employees take brief naps. Dimmers also help you gradually adjust the brightness of your lights as the day progresses, helping ease employees into the day and take advantage of natural light when it’s available. These days, customers expect businesses to be more conscious about their impact on the environment. Automation provides a path towards that goal by allowing you to reduce your office’s electricity consumption, which, in turn reduces your carbon footprint Timers, sensors, dimmers, and other automation features help you reduce your energy consumption, all while saving you money in the long run. Bottom line? It’s a win-win situation for you and your image. An automated lighting system may not be cheap, but the long-term savings will eventually pay for your initial investment. Lighting features such as dimming and scheduling will also make your employees happy and productive, all while addressing your organization’s social responsibility in preserving the environment. Switch to an automated lighting system now to modernize your office lights.